NOW TAKING PRE-ORDERS! BRAND NEW RELEASE BY PROVO CRAFT! The Yudu™ screen-printing system is the easiest, cleanest way to let everyone know who you are—and how you see the world. Don't settle for what everyone else is wearing or spend hours futilely trying to find a t-shirt that expresses the real you. 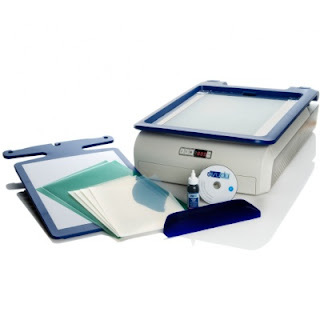 With access to a computer and an ink-jet printer, you'll be able to create and print your own designs not only for t-shirts or other apparel, but also for home decor, art prints, posters, cards, schoolwork, and much more! With this revolutionary personal screen printer, you can let your voice be heard today, no matter where you are or what you're doing. Unsilence yourself today with the Yudu Personal Screen Printer. To secure yours before they are released to stores please email me at customerservice@jujubeesscrapbookcorner.com or pre-order HERE! ***For more info on this exciting new machine visit YUDU. We are back from CHA Winter 2009! CHA Winter 2009 HERE WE COME!